The Getty Center opened to the public on December 16, 1997. Here on The Iris, the Getty’s president and directors of our four programs reflect on our past 20 years and the Getty’s relationship with Los Angeles. 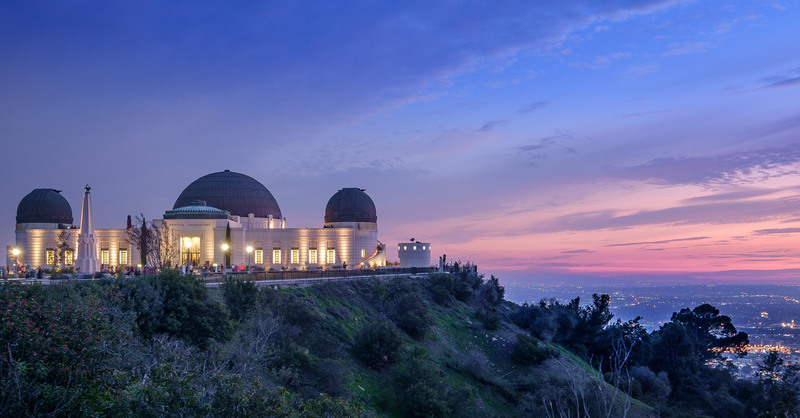 Here the director of the Getty Conservation Institute, which is dedicated to advancing conservation practice, highlights five of its recent initiatives in and around LA. —Ed. 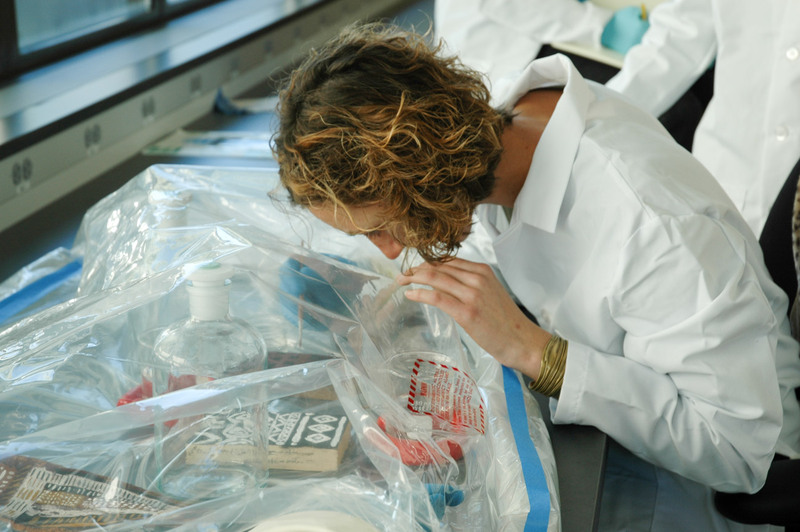 For over two decades the Getty Conservation Institute has happily and productively resided at the Getty Center. Our first home, from 1985 to 1996, was an industrial park in the Marina del Rey neighborhood of Los Angeles. In the summer of 1996, as construction of the Getty Center was progressing, we relocated to our purpose-built laboratories and offices at the Center, the first of the Getty’s four programs to call the newly built campus home. Over the years, being at the Center has given us more than splendid views of the Pacific Ocean and Los Angeles. 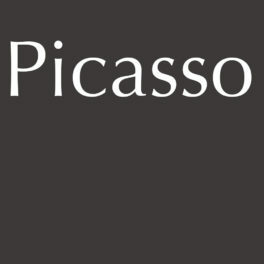 It has brought us closer to our talented and dedicated colleagues across the Getty and given us the opportunity to present our work through collaborative Getty exhibitions such as Jackson Pollock’s Mural, the Cave Temples of Dunhuang, and Making Art Concrete. Yet while our physical home may be the Getty Center, our larger home is Los Angeles and Southern California—and it’s been our privilege, since even before the Center opened, to bring our expertise out into our city to help conserve, protect, and bring public access to its cultural heritage. The first of our projects in Los Angeles took us to the city’s birthplace, El Pueblo de Los Angeles Historical Monument, or Olvera Street as it is known to most visitors. In this multiyear project, we collaborated with the City of Los Angeles to conserve, protect, interpret, and provide public access to América Tropical. América Tropical, painted in 1932, is the only mural by twentieth-century Mexican artist David Alfaro Siqueiros in the United States still in its original location. Commissioned for the Plaza Art Center, the outdoor mural is located on the second story exterior wall of El Pueblo’s Italian Hall. Measuring roughly eighty by eighteen feet, América Tropical depicts an indigenous Mexican peasant, crucified on a double cross beneath an American eagle, with two sharpshooters taking aim at the eagle from a nearby rooftop. Immediately controversial, the mural was partially whitewashed within a year of its completion and within a decade was completely painted over. With the rise of the Chicano mural movement in the 1960s, interest in the mural was renewed, followed by efforts to preserve it. In 1988, we began our decades-long partnership with El Pueblo, a department of the City of Los Angeles, to conserve and protect the mural. In the years that followed, we measured environmental conditions, analyzed the paint and plaster, performed the first phase of conservation treatment, and digitally documented the mural’s condition. 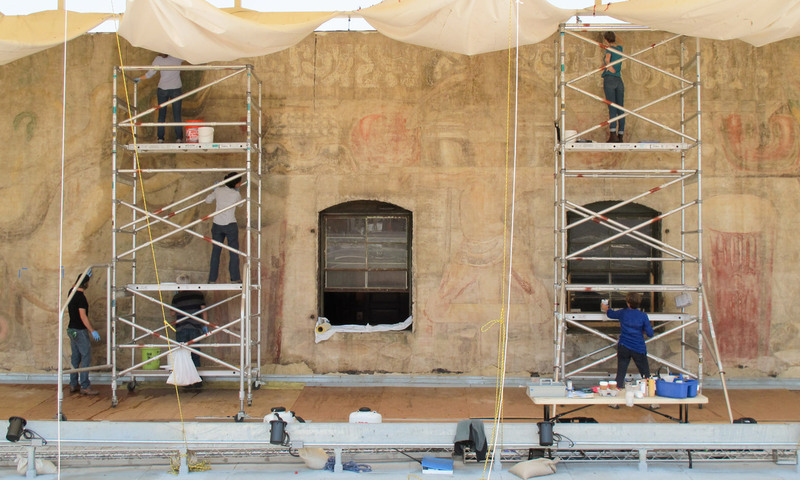 A thorough condition survey was undertaken in 1997; in 2002 we stabilized the mural and, with help from the Getty Museum preparations department, installed a temporary protection in front of it. By 2012, a protective canopy shelter, viewing platform, and interpretive center had been constructed. We carried out a comprehensive conservation treatment of the mural that included surface cleaning, injection grouting, loss compensation, removal of tar and residual tar staining, and minimal reintegration in areas of damage. In October 2012, eighty years after it was first unveiled, América Tropical was once again accessible to the public, the culmination of years of effort to preserve and showcase it. By the late 1990s, the Getty had supported a number of organizations and projects working to preserve the rich, diverse heritage of Los Angeles. This experience demonstrated to us that while Los Angeles has a wealth of resources, many are unrecognized, underutilized, and frequently threatened. The city had no systematic mechanisms to identify significant resources and to anticipate their preservation and reuse, yet a comprehensive survey could facilitate the critical connection between research and conservation—essential in establishing a property’s significance and in guiding preservation efforts. With this in mind, we conducted research in 2000 to assess the potential for the creation of a comprehensive, citywide historic resource survey in the City of Los Angeles. Our research revealed that while only fifteen percent of Los Angeles had been surveyed, there was support from city government, neighborhoods, the business community, and preservationists for compiling reliable information on the city’s historic resources. There was also momentum throughout the city for adaptive reuse, neighborhood conservation, and cultural tourism. Left: Conducting training for SurveyLA volunteers undertaking field surveys. Photo: Office of Historic Resources, City of Los Angeles. Center: Historic Places LA logo. Right: Los Angeles Mayor Eric Garcetti at the official launch of HistoricPlacesLA, held at Los Angeles City Hall. Photo: Tom Nakanishi. In 2002 we began working with the city and civic stakeholders, as well as state and federal agencies, to research historic resource survey methods and the use of a survey in the city’s cultural heritage and community development efforts. Concurrently, the city addressed with its departments the value of a historic resource survey and the ways a survey could be integrated into city goals and programs. In 2006 the City of Los Angeles created the Office of Historic Resources to develop and manage the municipal historic preservation program, and to direct the citywide survey, known as SurveyLA. Covering the entire city (over 880,000 legal parcels across almost 500 square miles), SurveyLA was jointly funded by the City and the Getty, with technical and advisory support from the Conservation Institute. This groundbreaking survey—the largest ever conducted in the United States—has served as a primary planning tool to identify, record, and evaluate historic properties and districts within Los Angeles. Using information gathered through SurveyLA, the City of Los Angeles launched HistoricPlacesLA, the Los Angeles Historic Resources Inventory in 2015. HistoricPlacesLA contains information on thousands of Los Angeles’s designated historic resources, showcasing the diversity of cultural resources in Los Angeles, including places of social importance, architecturally significant buildings, historic districts, bridges, parks, gardens, and streetscapes. 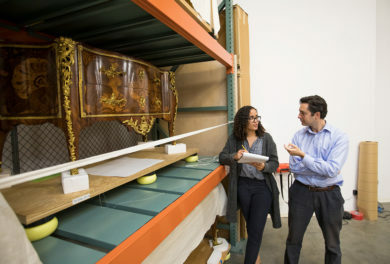 This online inventory, created through Conservation Institute customization of the Arches platform, is publically accessible to anyone concerned with Los Angeles’ cultural resources. The citywide survey was completed in 2017, and SurveyLA received the Los Angeles Conservancy’s Chairman’s Award, given for exceptional contributions to the field of historic preservation. In the late 1980s and early 1990s, seminal works of the modern architecture movement began reaching fifty years of age—the point at which they typically become eligible for heritage protection. Yet despite increased recognition of the cultural significance of modern architecture, there remains a lack of information on how best to conserve it. Modern buildings’ innovative construction methods, together with their use of new and sometimes experimental materials, have proved challenging to established conservation approaches and techniques. In 2012, we launched our Conserving Modern Architecture Initiative with the aim of advancing the practice of conserving modern architecture. Southern California, with its wealth of landmark twentieth-century architectural heritage, has been the site of two of our projects—the Eames House and the Salk Institute for Biological Studies. Among the most recognizable examples of midcentury architecture is Case Study House No. 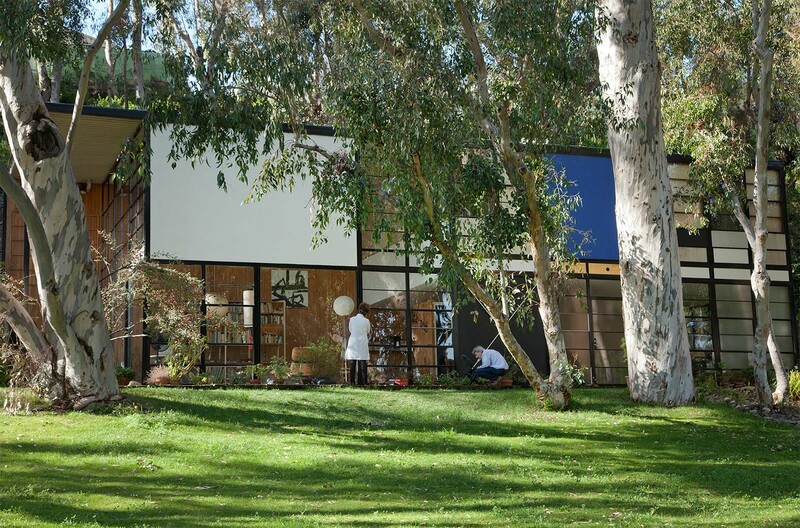 8, the home and studio of Ray and Charles Eames. Built in 1949, the site, house, studio, and interior collections tell a remarkable story about the architecture of this period, including the role of California modernism within an international context, and provide a view into the life of its occupants, opening a new understanding about the human side of modernism. In 2012, we began collaborating with the Eames Foundation on the long-term care of the house. We began by providing technical assistance to help the Foundation address some of the immediate building challenges, which involved external repairs and conservation of the living room floor and timber. At the same time, we’ve been working to establish a long-term conservation framework, including developing a conservation management plan that provides a strong management tool for stewarding this modern icon. Environmental data collected over a number of years will help to develop a strategy for improving indoor environmental issues in order to conserve the house’s important collection. An assessment of risks has been undertaken to ensure that these are mitigated by future conservation planning. Our second modern architecture project in Southern California has taken us farther south, to La Jolla and the work of Louis I. Kahn. Completed in 1965, the Salk Institute for Biological Studies is considered one Kahn’s finest works and an iconic work of modern architecture with international significance. 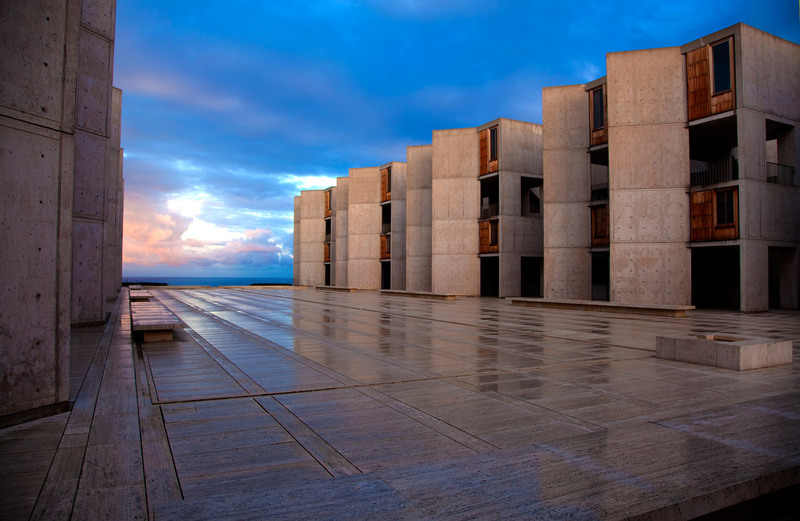 Kahn was commissioned by Dr. Jonas Salk, developer of the polio vaccine, to design an inspiring campus for his new scientific research institute to be located a coastal bluff overlooking the Pacific Ocean. Kahn’s design consists of two nearly identical wings of laboratory, study, and office space mirroring each other on either side of a paved central plaza. The exterior materials palette consists of concrete, teak, glass, travertine, lead, and steel. But after nearly fifty years in an exposed marine environment, the teak wood at the pre-fabricated window wall assemblies in the buildings’ studies and offices was weathered to a non-uniform appearance, was deteriorated, and was in need of repair. Left: Investigating the failure of the vertical siding boards and furring strips following a storm in February 2014. Right: Collecting small samples from the site for laboratory analysis of past surface treatments. We were invited by the Salk Institute in to create a conservation-based approach to the long-term care of the window wall assemblies and other architectural elements of the site. We conducted historic research, on-site condition surveys, scientific diagnosis, and mock-up trials, and then developed treatment recommendations that guided cleaning and repair of the teak, which was completed in mid-2017. Since the Conservation Institute’s inception, one of our core areas of work has been professional conservation education, including offering workshops and courses for practicing professionals. Early in our history, we determined that a graduate-level program on archaeological and ethnographic conservation was needed to fulfill a widely recognized need in the field for conservators with expertise to address the particular issues associated with archaeological and ethnographic collections. The Getty’s search for a university with which to develop this graduate-level program began in the 1990s. Fortunately, Southern California is home to leading research universities both public and private, and after a series of meetings and exploratory discussions with several institutions, the University of California, Los Angeles (UCLA), was determined to be the right partner to develop this much-needed program. With facilities at both the Getty and UCLA, the program is administered through the Cotsen Institute of Archaeology at UCLA. 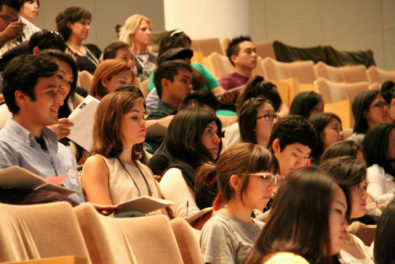 Now in its tenth year, and having graduated 32 new conservation professionals, the UCLA/Getty Program in Archaeological and Ethnographic Conservation, remains the only graduate-level academic conservation program on the West Coast and the only one in the United States to focus solely on archaeological and ethnographic materials. We approached these initiatives in Los Angeles and Southern California the same way we have all of our work, wherever it is around the globe: We are guided by our mission to advance conservation practice. By working to preserve the world’s cultural heritage, we strive to strengthen civil society. It is at the center of all we do. I'm director of the Getty Conservation Institute.